US President Donald Trump has not projected the sort of geniality toward Europe that would relax its leaders. Insecurity over populism and Russian Federation President Vladimir Putin has overwhelmed European leaders, officials, analysts, academicians, and journalists, but Trump seems to worry them almost equally. They do not get him. Perhaps the best hope now would be for European leaders and officials to step away from the current environment and try to quietly examine Trump from a different angle for the sake of transatlantic relations. Europe has managed to promote multilateral cooperation under difficult circumstances in the past 70 years. Perhaps the best example of that cooperation was the formation of NATO in 1949. There was a sense of uncertainty, a degree of instability, and a real threat from the Soviet Union. Foreign policy and global strategy were not well-coordinated among Western capitals. However, with the leadership role of the US, but also with distinctive leading roles played by European countries, what is the now well-known as the Western perspective grew. Pragmatic and patient efforts were to coordinate the policies of Western European countries together with the US and Canada until a new system of European security was developed. Currently, there is increased anxiety in European capitals with regard to EU unity, a rise in populism, and the threat posed by Russian Federation Vladimir Putin and his armed forces. Uncertain of the new US administration’s intentions and plans regarding the support of Europe, European leaders and officials have been turning left and right, asking questions, searching for useful answers. Finding genuine, constructive answers in what could called a counter-Trump milieu has proven most difficult. Indeed, with all of the news media stories, and the nonstop rebuke of Trump by political opponents at home and pundits worldwide, there hardly seems space available in the current environment to introduce into the discourse other facts or evidence about the US president other facts or evidence about the Trump administration without obstruction. 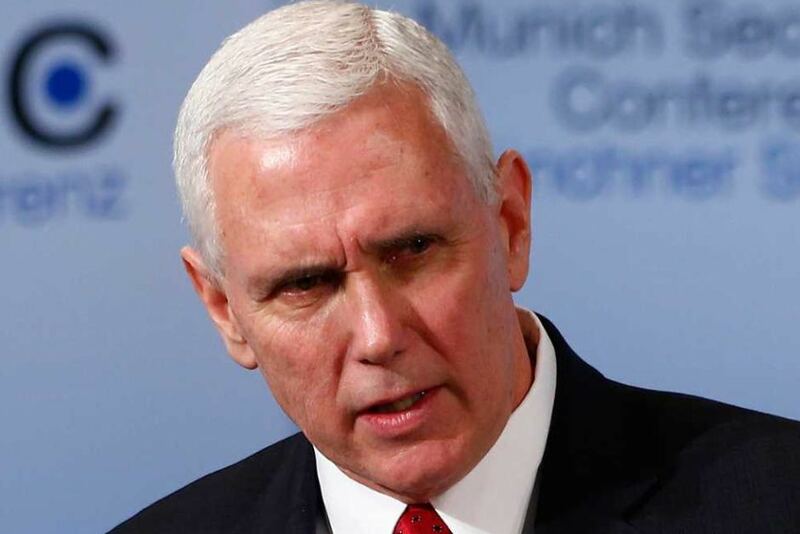 At the 2017 Munich Security Conference, US Vice President Mike Pence’s address was eagerly awaited. He offered reassurances from Trump. However, the Europeans wanted a public embrace of their institutions by the US, but they say it was not given. There hardly seems space available in the counter-Trump milieu in Europe for anyone to introduce other facts or evidence about Trump and his administration without obstruction. Animus quod perdidt optat atque in præterita se totus imagine versat. (The mind yearns for what is gone and loses itself dreaming of the past.) National leaders are expected to project a certain geniality. In democracies, that geniality can boost a candidate’s appeal to the public in elections. Once in power, that geniality makes for great optics, and to a degree may still help shape public opinion, but the main task of a leader is to perform one’s duty and responsibilities well. Trump has not projected the sort of geniality toward Europe that would relax leaders in Brussels or any of the national capitals. There has been a tumultuous clamor in Europe over him. The most apparent causality for the Europeans are the ties of a few senior members of the Trump administration might have with the Russian president. Europe’s expression of such irritation and concern exposed the considerable degree of insecurity, and to a degree, fear, that overwhelms the latest generation of European analysts, academicians, and journalists not only over populism, Putin, and Russian military power, but the US almost as much. They appear unable to read Trump and discuss him in a way that cannot seem to avoid use of obloquy. The nascent days of the Trump administration certainly contrast in this way with those of administration of US President Barack Obama. Obama seemed to specialize in studied ambiguity on foreign policy, speaking comfortable words to address urgent and important issues as well as outright provocations. It was in line with what then Vice President Joe Biden called “the new tone” of US foreign policy at the 2009 Munich Security Conference. The Obama administration held the promise of a kinder, more thoughtful US than was observed with the administration of his predecessor US President George Bush. Biden urged Europe to ramp up its efforts and partner with the US in an effort to re-establish a workable world order. Those early days with Obama in office appear sorely missed by the Europeans. However, waxing nostalgically about the Obama administration will not serve European leaders well. Moreover, with nostalgia, one more often remembers the best and filters out the worst. Some might recall that Europe voiced concern over how passively Obama responded to provocations such as Russia’s threat to deploy weapons against former Soviet republics and cut natural gas supplies to Europe, and Iran’s launch of a satellite and development enough uranium to fuel a nuclear bomb. Now, concerns are being expressed about another US president’s response concerning European security. 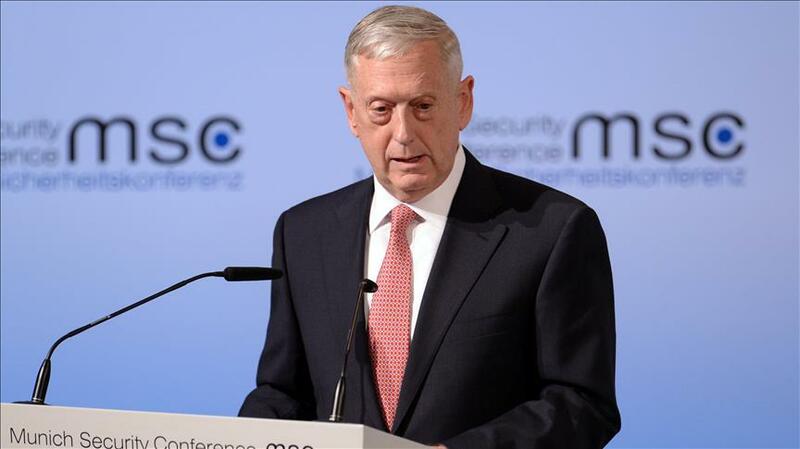 US Secretary of Defense James Mattis at the 2017 Munich Security Conference (above). No benefit will be derived from undermining the US leadership when a response from the US against Russia might prove crucial to Europe’s well-being. European leaders and officials must recall that the ties between the US and Europe have a long history. It is a bond which no US administration would genuinely desire to ignore or want to break. In time, Europe will likely understand that the relationship is still of great value to the US and is appreciated. When one is less certain about the objective truth, the possibility that one might be drawn elsewhere for answers increases. Lacking any formal statements from the the Trump White House or State Department to analyze US policies, it appears that some in European capitals have turned to the US news media interpretations of political events and decisions of the Trump Administration. In the US, the news media serves as a watchdog over government power and political activity. It is a source from which the public can inform itself on the decisions and actions of elected leaders and appointed officials. The news media is at its best when it can provide the public with a look inside government bodies and operations. Its role in the society is sacrosanct. “Freedom of the press” is one the Bill of Rights, the first ten amendments of the US Constitution listing specific prohibitions on government power. The implications of comments emanating from the Trump administration about the “fake news media” being the “enemy of the American people” are considerable. Ignoring the “fake,” Some have gone as far as to say that denunciation of the news media is the “greatest threat to democracy” they have seen. The news media, the unofficially recognized “Fourth Estate” or fourth branch of government given its importance to the democracy, is not the enemy of the US public. Such comments were unlikely fully considered before spoken, and eventually became fodder in an ongoing struggle between the Trump administration and certain US news media houses. It appears the aim of those grave words initially was to reject and certainly sting some in the news media in response to reports questioning the character of Trump administration officials, but not to be destructive, or to indict the news media as a whole. Events surrounding the Trump administration have gained increased attention. There is a reality that news media houses would like to present attention grabbing headlines to promote readership and viewership, which helps them fill advertising space and increases profit. Indeed, it must be noted that the news media, while a sentinel for democracy, is also a major industry, and managers in houses seek to satisfy the appetites of their customer base. To patronize in order to connect with the customer is a business practice. In the case of reporting on Trump, most journalists in newspapers of record, to their credit, have written articles that are often measured in composition, providing ample qualifications alongside each postulation. Due to the doubts attached, it stands to reason that information presented in this way should neither be viewed as weighty nor reliable. Others have sought to convince readers that stories are bigger than they are. Such articles exaggerate the truth to the exclusion of it subtleties. Even more, some journalists’ judgments of matters they report about the Trump administration have often insinuated themselves into their articles. That approach on occasion has very likely served to inflame passions and appeal to the lower nature of many readers and viewers, domestically and internationally. What has been stated here may appear as a foray by greatcharlie into media criticism, but actually the intent is to highlight the current environment surrounding the US news media from which many European leaders and officials may be collecting information on the administration. 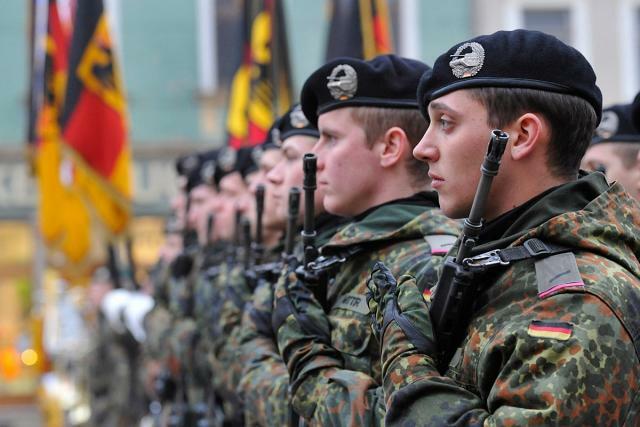 German soldiers in formation (above). Lacking any formal statements from the the Trump White House or State Department to analyze US policies, some in European capitals may have turned to the US news media interpretations of political events and decisions of the Trump Administration. Some of those reports may served to inflame passions and convince them that their worst fears regarding US relations were being realized. That would include facing Russia alone. 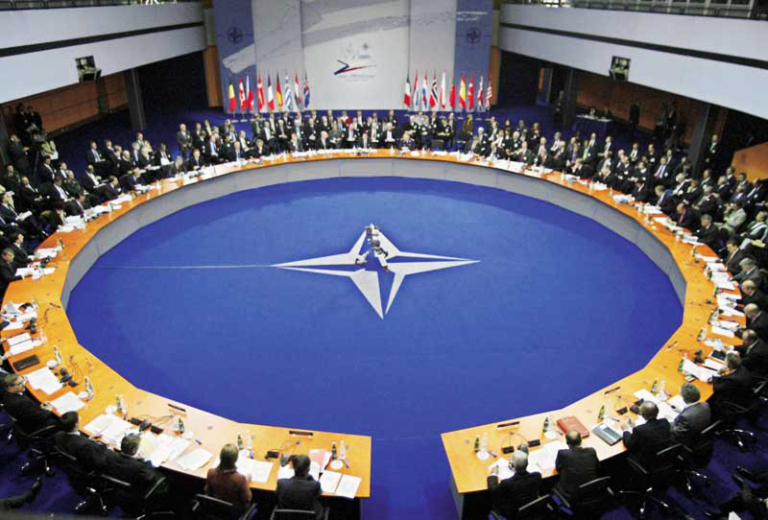 A NATO meeting in Brussels (above). There are considerable incongruences between what is being assumed today about the Trump administration’s approach to Europe and what has been US policy over 70 years. Europe should be hopeful over its future with the US, not anxious or intimidated. Years of success should not be forgotten by Europe over the prospect of working with the new US president to firm up some aspects of the relationship. Poenam irae saepe videmus. (We often see the penalty of anger.) In the February 19th New York Times article, Artis Pabriks, a former Latvian foreign and defense minister and now a member of the European Parliament, was quoted as saying “The Cold War was won not just by weapons but by propaganda and soft power.” Pabriks then offered the observation, “And on German television, Trump is a joke for everybody. We’re concerned also about American prestige.” In Western media, particularly social media, sites that encourage or present hostile assessments of celebrities, political figures, or those who may have drawn the spotlight to themselves for one reason or another, grab more attention than all other. The attention and approval one can gain from engaging such commentary has made it may in part help make it commonplace. Indeed, there is a tendency for many, perhaps even most, to demonize those with whom there is disagreement. Demonization has often morphed into hatred. This behavior was both very apparent and very virulent in the 2016 Presidential Campaign. Going back as far as the 18th century, many said worse. Often such hostile talk led to duels. Still, the intensity and sheer volume of exchanges and reports of exchanges that jammed social media and news media streams made what was expressed not only pervasive, but practically unavoidable. The environment has not improved, but perhaps has become worse since then. There is still the punch and counterpunch between political opponents, pundits, and the news media, itself, with the Trump administration. Disagreements seem to have become endless feuds. 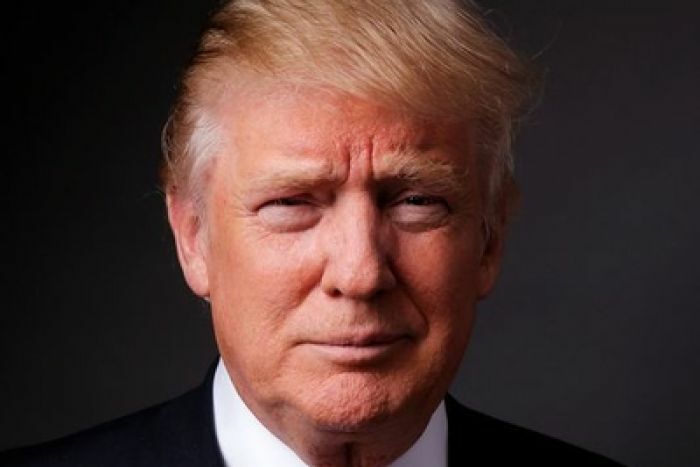 For European leaders and officials, the danger lies in stepping into this struggle, taking one side or another in the exchange in the US about the Trump administration because they believe the status of the US president falls with their interests and their constituencies want to know where they stand on such a popular and controversial, yet also delicate matter. There are considerable incongruences between what is being assumed today about the Trump administration’s approach to Europe and what has been US policy over 70 years. Europe should be hopeful over its future with the US, not anxious or intimidated. Years of success should not be chucked out by Europe over the prospect of working with the US to firm up some aspects of the relationship. There are insistent efforts to advertise Trump’s perceived weaknesses. Some news media houses have approved stories that include unwarranted extrapolations. Only European leaders and officials would know what moves them to believe one thing or another about Trump. It may be experience, intuition, or mores. Despite the importance of relations with the US, it could be hypothesized that some may harbor negative beliefs in general about their ally. In any event, confirmation bias can be a result of the direct influence of desire on beliefs. Confirmation bias suggests that individuals do not perceive circumstances objectively. An individual extrapolates bits of data that are satisfying because they confirm the individual’s prejudices. Therefore, one becomes a prisoner of one’s assumptions. If European leaders and officials want certain ideas about Trump to be true, they end up believing them to be true. Such an error could have lead them to cease collecting information when the evidence gathered at a certain point confirms the prejudices they may feel are true. After developing that view, for the most part, they would embrace any information that confirms it while going as far as to ignore or reject information that makes it unlikely. Attempting to confirm beliefs comes naturally to most individuals, while conversely it feels less desirable and counterintuitive for them to seek out evidence that contradicts their beliefs. This explains why opinions survive and spread. Disconfirming instances must be far more powerful in establishing truth. Disconfirmation requires searching for evidence to disprove a firmly held opinion. With regard to their understanding of the Trump administration, European leaders and officials must appropriately verify their conclusions. One approach is to postulate facts and then consider instances to prove they are incorrect. This has been pointed to as a true manifestation of self-confidence: the ability to look at the world without the need to look for instances that pleases one’s ego. For group decision-making, one can serve a hypothesis and then gather information from each member in a way that allows the expression of independent assessments. 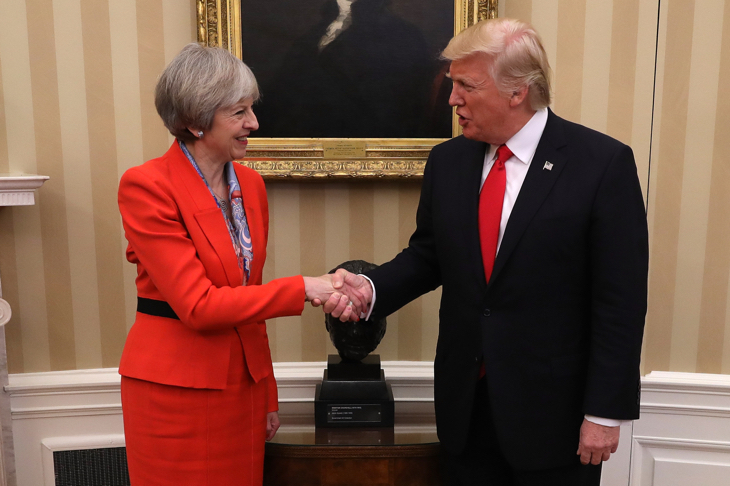 United Kingdom Prime Minister Theresa May and Trump (above). Political and social pressures to conform to a counter-Trump outlook may exist in Europe, but relations with the US are too important for European capitals to allow the situation to deteriorate so acutely. European leaders must not embrace any information that confirms any individual biases or prejudices they might have about Trump. The thinking that may have caused them not to consider alternatives must be subtracted. With all of the news media stories, and his nonstop rebuke by political opponents at home and pundits worldwide, an environment that would welcome an unobstructed examination or public discussion of other facts or evidence about Trump is practically nonexistent. Antipathy may strong enough in some European leaders and officials that they may be disinclined to take a second look at anything pertaining to Trump. Indeed, among them may be cynics who are uninterested in the truth. They may wrongfully view any effort rectify the situation as obsequiousness in the face of US power, placing political pressure on colleagues who may want reconsider some issues. Some may claim seeking to work with Trump would pose some moral dilemma. However, such could exist only when one knows the objective truth, disapproves of the course of events and is constrained from conforming to external demands. Enumerated here are many of the symptoms of groupthink. Groupthink occurs when a group makes faulty decisions due to group pressures lead to a deterioration of ”mental efficiency, reality testing, and moral judgment.” The term was coined by social psychologist Irving Janis in Victims of Groupthink: A Psychological Study of Foreign-Policy Decisions and Fiascoes (Houghton Mifflin, 1972). Groups affected by groupthink will tend to ignore alternatives and take irrational actions that dehumanize other groups. Groups become especially vulnerable to groupthink when members are similar in background, the group is insulated from outside opinions, and there are no clear rules for decision making. The eight symptoms of groupthink documented by Janis include: the illusion of invulnerability which creates excessive optimism that encourages taking extreme risks; a collective rationalization, by which group members shrug off warnings and do not reconsider their assumptions; a belief in inherent morality by which members believe in the rightness of their cause and therefore ignore the ethical or moral consequences of their decisions; stereotyped views of “out-groups” or negative views of “enemy” make effective responses to conflict seem unnecessary; direct pressure on dissenters by which group members are under pressure not to express arguments against any of the group’s views; self-censorship which thwarts the expression of doubts and deviations from the perceived group consensus; the illusion of unanimity which creates the assumption that the majority view and judgments are unanimous; and, self-appointed “mindguards” who are group members that protect the group and the leader from information that is problematic or contradictory to the group’s cohesiveness, view, and decisions. Decisions shaped by groupthink have a low probability of achieving successful outcomes.When the above symptoms, and such conditions by all indications exist to some degree among foreign policy officials in European capitals making decisions on the Trump administration, there is a reasonable chance that groupthink will happen. However, it does not need to be so. Groupthink occurs when groups are highly cohesive and when they are under considerable pressure to make a quality decision. Within respective capitals that might be the case, but among countries cohesion is attenuated. The political and social pressures to conform to counter-Trump outlook may exist, but relations with the US relationship is too important for too many countries to inexcusably allow the situation to deteriorate so acutely. European leaders and officials should drive themselves to realistically appraise courses of action available to them. Any carelessness and irrational thinking that led to the failure to consider all alternatives along the wrongful path to groupthink must be subtracted. 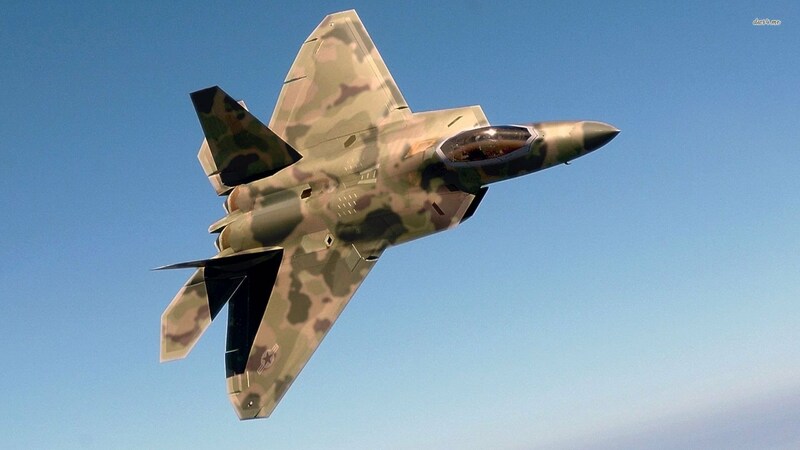 A US F-22 Raptor (above). Ensuring Europe’s well-being is in the interest of the US. If grave harm ever came to any US ally or partner in Europe, the impact in all quarters in Washington would be shattering. It would guarantee a devastating, immediate response by Trump. Europe faces no danger of abandonment by the US despite how Trump or his senior officials may sound. Trump only speaks of pruning the leaves and branches of the tree, he does not want to poison the root. Diu in ista nave fui et propter tempestatem nubesque semper mortem expectabam. (I was on board that ship for a long while, and I was constantly expecting death on account of the storms and clouds.) Among Trump’s immediate thoughts about Europe have been to make some changes with regard to security. The big issue is failure of some European countries to meet their financial commitments to NATO. In reality, some European countries have been remiss, consistently failing to meet a 2 percent GDP goal agreed to by alliance members. Trump wants to resolve that issue with the Europeans. However, Europe faces no danger of abandonment by the US despite how his words or those of his senior officials. To use a soft metaphor, Trump only speaks of pruning the leaves and branches of the tree, he does not want to poison the root. (Certainly, if Trump’s goal was to get Europe’s full attention with his statements, he has succeeded in that.) Yet, many in Europe have formed opinions that contrast with this reality. They may not be disposed to pursuing the truth, fearing what the truth may be. Worrying about US actions and intentions is a new type of stress, posing unfamiliar and unimaginable challenges. University of Chicago Executive Vice Provost and Professor of Psychology, Sian Beilock, has spent years investigating how people perform under pressure and avoid failure. She has published more than 100 papers on the subject, and recently won the 2017 Troland Research Award from the National Academy of Sciences for her research. Her most recent book, How the Body Knows Its Mind (Simon & Schuster, 2015), discusses what scientists have learned about the influence of body movement on brain activity. It includes tips such as pacing around a room for a creativity boost. At the Human Performance Laboratory, where she is director, Beilock and her colleagues explore the physiological mechanisms by which people buckle under pressure. They have measured the amount of cortisol in a person’s saliva to gauge stress levels and have used neuroimaging to see which areas of the brain are activated during high-pressure situations. Beilock has found that individuals are capable of making just about anything become a stressful, high-stakes activity. She explained, “Some of the greatest chokes are on the Olympic stage, but they also happen when you can’t say eloquently what you want to say in a meeting.” Overthinking often trips people up. “It’s paralysis by analysis,” Beilock says. Individuals can get confused when they think too much, worry too much, about what they are doing. Beilock also tests subjects’ reaction times and accuracy at the Human Performance Laboratory to understand performance failure. She often includes golfers in her research. Many golf pros claim the sport is 90 percent mental making it an ideal forum for her research. At the professional level, some golfers fail to perform well in front of spectators. Beilock has found golfers easily become stressed when caused to think about the technical aspects of their swing. She explained, if you really want to mess with a golfer’s game, you could just say, “That was a great shot! What were you doing with your elbow?” On her blog, Beilock calls attention to Bruce Ollstein, a former drill instructor and US Army Psychological Operations officer, who delved into the effects of stress on golfers in his book, Combat Golf: The Competitor’s Field Manual for Winning Against Any Opponent (Viking, 1996). Ollstein explains that a few choice words will typically have a deleterious effects on a golfer’s morale and performance. Among those methods, Ollstein listed: hand out some “gimmies”; plant seeds of doubt; leave them “hanging”; and, silence is golden. 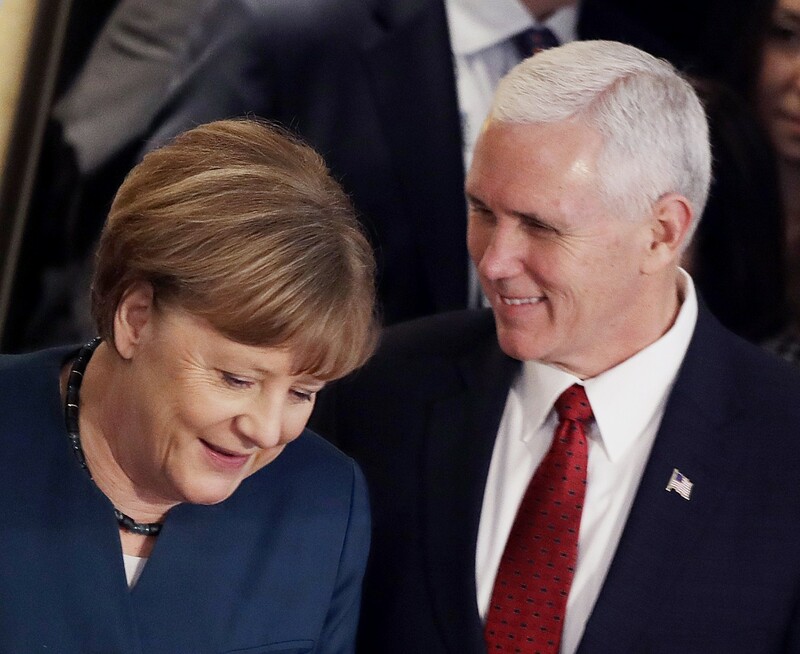 German Chancellor Angela Merkel and US Vice President Mike Pence (above). European leaders and officials must no longer fall prey to attention grabbing news stories about Trump, some of which have supported very wrong notions in Europe about his plans. They must be wary of experts who postulate on very important matters from the abstract. Additionally, they must guard against self-deception. It may very well be that, albeit unintentionally, US foreign policy experts in discussing Trump with their European colleagues as well as with European leaders and officials, they may have had a deleterious effects on their perspective, morale, and performance. Leaders and officials may have been thrown a bit off-kilter, and delayed getting both involved and into a working rhythm with the Trump administration after learning of US news media reports and comments from the Obama administration in its waning days. Consider that from the start of 2016 Presidential Election, uncertainty was created about what a Trump victory would mean for Europe given some harsh campaign comments on NATO. It likely had a chilling effect on them. However, assurances also came from all quarters that former US Secretary of State Hillary Clinton would win the election. After the election there was more turmoil, and before the Europeans could formulate an approach to Trump, they encountered a flurry of reports detailing his inexperience and how unprepared he was to appropriately handle foreign policy decisionmaking. Doubts were expressed about his advisers perspectives and abilities. Questions were raised about Russia’s influence on the election result and Trump’s campaign. 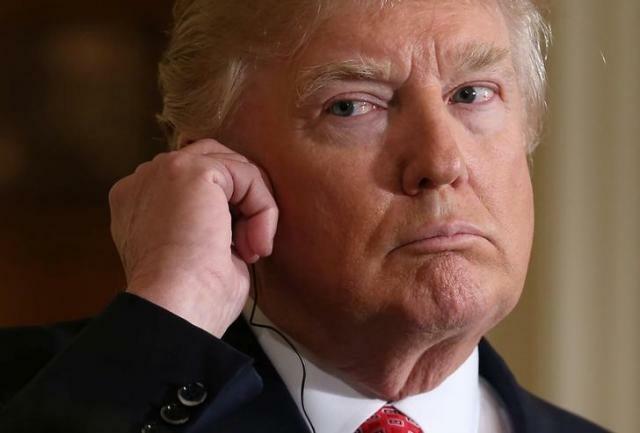 Stories were told of a war between Trump and the US Intelligence Community, and rumors swirled that Trump might face impeachment. With a second look at Trump, European leaders and officials may recognize an intriguing duality. In business, he engaged in high stakes negotiations and hefty transactions, but also displayed talent as a builder, a man who created things. Designing and constructing buildings was an art for Trump. As a media celebrity, he lived a life of high drama while he entertained. During the 2016 US Presidential Campaign, Trump’s capabilities seemed to coalesce in an interesting and effective way. Quid enim est stultius quam incerta pro certis habere, falsa pro veris? (What, indeed, is more foolish than to consider uncertainties as certain, falsehoods as truths?) The renowned 19th century Prussian statesman, Otto von Bismarck said “Politics is the art of the possible.” To better understand Trump and improve relations with the US, European leaders and officials must set aside their personal preferences. There are some solid reports that present positive perspectives on Trump. Those reports as well as any that may even appear feeble, must be examined. The analytical process in the current environment must be akin to a crucible in which irrelevancies are burned off and result is the truth. If European leaders and officials could disassociate themselves from the mixed, very often negative, signals emanating out the political milieu in the US, they might recognize an intriguing duality about Trump. In business, Trump for decades engaged in high stakes negotiations and hefty transactions. He displayed talent as a planner, manager, and builder, a man who created things. The German philosopher Friedrich Wilhelm Joseph von Schelling said, “Architecture is music in space, as it were a frozen music.” The architecture of Trump’s buildings and music would have things in common such as rhythm, texture, harmony, proportion, and dynamics. For Trump, designing and constructing buildings was an art. He could become lost in it. That was Trump’s world, too. As a media celebrity, he lived a life of high drama while he entertained and bedazzled. During the 2016 Presidential Campaign, Trump’s varied capabilities and interests appeared to coalesce in an interesting and, albeit, effective way. On the surface, Trump was self-confident, audacious, brash, and bombastic–some might add boorish, yet in his planning, he was humble, meticulous, perceptive, and innovative. European political leaders might take special note of how Trump, facing constant waves of invective, even calumny, dug deep inside himself and always found a way, leaving other candidates trailing in his wake. This stands in stark contrast to the notions of Trump’s alleged vacuity, which is more often deceitfully served up by a variety angry, aggressive, envious, and ambitious sources camped in all directions. They all certainly have reasons for their positions. The presidency represents a huge change for Trump and he continues to recurvate from being a very successful businessman and celebrity known worldwide to a more potent, more formal, and in many ways, more narrow role. Regarding all of the opprobrium, Trump has seen other winds and has faced other storms. He has no reputation for faltering in adversity. When Trump stated “America First” during his inaugural address on January 20, 2017, he was presenting the term as a concept, a guiding principle indicating that his administration would consider the interest of the US over anything else. Trump will unlikely be disposed to subordinating the interests of the US to the wishes of any country. However, ensuring Europe’s well-being is in the interest of the US. If grave harm ever came to any US ally or partner in Europe, the impact in all quarters in Washington would be shattering. It will guarantee a devastating, immediate response by Trump. The Trump administration continues to evolve. Recently, US Army Lieutenant General H. R. McMaster, a renowned military strategist and national security expert, became Trump’s new National Security Adviser. Looking toward the future with optimism, the US president will most likely find his stride very soon on relations with Europe. A new balance may be observed and perhaps many European leaders and officials will appreciate Trump’s very formidable, comprehensive capabilities. After all that has been said and done, some Europeans remain optimistic. Thomas Matussek, a former German ambassador to the United Kingdom and the UN, said that “people will be reassured to some degree, because they want to be.” He contrasted Trump and White House Special Adviser Stephen Bannon: “Trump’s not an ideologue, like Bannon, but pretty pragmatic and innovative, subject to discussion.” Robin Niblett, the director of Chatham House, a London-based research institution, expressed optimism saying: “Trump does not come in with a fixed foreign-policy agenda on many issues, so there is contested space and room for influence and maneuver.” Niblett recalled Trump’s early “flip-flops” on Israel and NATO, but then explained: “Trump’s fixated on certain things, like trade and jobs and America’s place in the world, but there seems to be room for influence.” Artis Pabriks, a Latvian member of the European Parliament mentioned earlier, said that he trusted Mattis and McCain, and applauded the recent introduction of US and other NATO troops into the Baltic States and Poland. He expected Trump will keep that policy approach in place. The Trump administration continues to evolve. 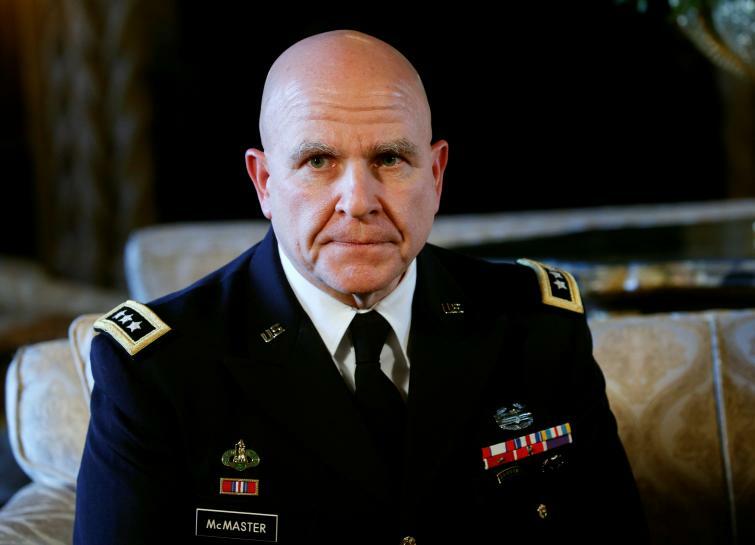 Recently, US Army Lieutenant General H. R. McMaster (above), a renowned military strategist and national security expert, was named Trump’s National Security Adviser. Looking toward the future with optimism, Trump will likely find his stride soon on relations with Europe. A new balance may be observed and European leaders and officials may come to appreciate him. Many times, from bad beginnings, great friendships have sprung up. In Act I, Scene iv of William Shakespeare’s play, Measure for Measure, Lucio, a man living the “sporting life” in Vienna, was urged to speak with Isabella, a St. Clare nun, about her brother Claudio’s arrest by Angelo, the very officious, upstanding acting executive of the city. Lucio sought to convince Isabella that she could successfully use her wit and influence to have her brother released. In that effort, Lucio speaks to famous lines to Isabella: “Our doubts are traitors and make us lose the good we oft might win by fearing to attempt.” Man-made dilemmas are not mysteries, but puzzles. While one may be confused, or tested by a puzzle, they have solutions. For now, the solution to strengthening Europe’s relationship with the US is temporarily hidden, temporarily misunderstood. Talk about Trump in Europe has absorbed not only regional and national leaders and other officials, but the public’s attention in every country of the continent. Due to what will eventually be recognized as misunderstandings, there have been some bouts of words, albeit a bit attenuated, which have created some disturbance, hurt some feelings, caused some wounds, on both sides of the Atlantic, but they must be soothed and healed. European leaders and officials must act before a numbness sets in, before Europe is inured by the idea that it cannot work with the Trump administration, that it must face challenges such as a resurgent Russia alone. With obstinacy, they must seek to regularly engage with Trump and administration officials in rational, concrete discussions to find agreement or a satisfactory middle ground on issues. The process of changing the current environment should begin with the application of the objective truth to analyses of the new US administration. Europe must reexamine what it knows about Trump. Being readily available, the US news media should naturally be seen as an open, overt source of information on Trump and his administration. However, not all news media houses produce news the same way. Mistakes are also made. While it albeit serves as a watchdog for the democracy, admittedly, some US news media have propagated very negative perspectives of the Trump administration. European leaders and officials must not fall prey to attention grabbing lines about Trump, some of which have supported very wrong notions in Europe about his plans. They must also be wary of experts who postulate on very important matters from abstractions. Additionally, they must guard against self-deception. All of the plans and actions of European leaders and officials must be directed toward benefiting the lives of their people. Certainly this prescription cannot be more grievous than the danger of poor relations with the US. Russian Federation President Vladimir Putin (center) with Russian Federation Defense Minister and General of the Army Sergei Shoigu (left) and the commander of the Western Military District Colonel General Anatoly Sidorov (right). Through Russia’s participation in the Iran Talks, Putin learned much about decision making among the Western powers from the inside and likely feels better able to deal with them diplomatically and militarily. Etiam sapientibus cupido gloriae novissima exuitur. (The desire for glory is the last infirmity to be cast off even by the wise.) Every step toward a final deal has brought US President Barack Obama closer to the legacy-defining foreign policy achievement he has sought. Obama’s desire to establish his legacy during his second term office has been a subject regularly discussed among White House officials and US political pundits. Yet, it is uncertain whether a final agreement can be reached and whether it would hold. The notion of how the P5+1, particularly the US, would likely respond to a violation of the treaty by Iran has gone through a transformation process during the negotiations. It was once understood that the US would inevitably decide to stop Iran from moving closer to developing a nuclear warhead by force of arms. Senior Obama administration foreign and defense policy officials made it clear that military intervention was “on the table.” Threats of regime change and of imposing a US form of democracy on Iran by the administration of US President George W. Bush were still ringing in Iranian leaders’ ears when the Iran Talks began. The idea of being attacked by the US became engrained in the psyche of Iran’s leadership, offsetting any idea Obama lacked the will to take military action following the Syria gas attacks debacle. Tehran’s views have changed since then. Fas est et ab hoste doceri. (It is right to learn even from an enemy.) The P5+1 has served to present a united front to cope with the common danger of a nuclear armed Iran. However, the coalition has not been truly united. Russian Federation President Vladimir Putin has actually exploited the comity between Russia and its P5+1 partners to protect Russian interests. (The other P5+1 partners may very likely be aware of this.) Putin did not want the P5+1 to take military action against Iran, Russia’s strongest Middle East partner. During the Iran Talks, Russia and Iran made unilateral deals on matters from agriculture to weapon systems. The talks have helped Moscow better understand how Western powers approach issues as Iran’s nuclear program, making Russia better able to handle the West on issues as Ukraine. Russia, as Iran, is coping with Western economic sanctions. Putin has heard many threats to use force against Russia, albeit defensively, through NATO. However, Putin responds to such threats with an enigmatic face. Putin has Russia on the march, seizing territory in a piecemeal fashion, but he undoubtedly has a sense of how far he can go. Observing the decision making of Western powers up close on Iran, Putin likely believes military action against a capable opponent is the last thing Western political leaders want. (It is the last thing he wants, too!) To that extent, he also likely believes that after he has acquired enough, he will be able to legitimize Russia’s acquisitions through talks. As a Member of the Permanent Five Members of the UN Security Council, Russia’s role as a party to the nuclear negotiation was essential, but it was also rather extraordinary given its ties to Iran. Russia had a very positive, congenial relationship with Iran unlike Western states in the P5+1. Iran’s Defense Minister Hossein Dehghan stated “Iran and Russia are able to confront the expansionist intervention and greed of the US through cooperation, synergy and actuating strategic potential capacities.” When the Iran Talks began, Russia was actually working closely with Iran in support of its longtime ally, Syrian President Bashar al-Assad who Western members of the P5+1 opposed. However, despite Iran’s close business and economic ties or ongoing military cooperation with Russia, albeit limited, could not guarantee the US would refrain from moving against its strongest partner in the Middle East. For that reason, Putin likely had genuine concern that Iran would become a target of massive US military action if the Iran Talks did not succeed when they began. Putin had not forgotten that close cooperation between Russia and authorities in Tripoli and Damascus did not deter the Obama administration from promoting and supporting insurrection against them. Under UN Security Council Resolution 1973, multinational forces under NATO command went beyond imposing a no-fly zone and destroyed government forces loyal to Gaddafi as part of Operation Unified Protector. Gaddafi’s regime fell and he was killed. In Syria, the Obama administration responded in support of the Syria Opposition Movement which bloomed during the so-called Arab Spring. The removal of Assad and his regime was the Obama administration’s goal. Moreover, before the Iran Talks began and during the negotiations, Obama and officials in his administration were unambiguous about plans to act militarily against Iran over its nuclear program. According to a March 14, 2013 article in the Times of Israel, Obama explained that Iran could produce a nuclear weapon in just over a year and diplomatic efforts have just less than that to halt Iran’s drive to the bomb. The Times of Israel determined Obama was intimating that if diplomatic efforts failed this year or early next year, the US would be forced to carry out military action against Iran. Obama also reportedly explained that he had been “crystal clear” that a nuclear-armed Iran was a “red-line,” and that the US was committed to preventing Iran from acquiring a nuclear weapon with which it could threaten Israel or trigger a regional arms race. In a September 15, 2013 article in the Guardian, Obama sought to shore up the potency of US deterrence against Iran warning that he was still prepared to take military action against the Iranian nuclear program, which he described as “much closer to our core interests” than Syria’s chemical weapons. A February 26, 2014, Reuters article reported Kerry told a group of reporters that the US has an obligation to pursue nuclear negotiations with Iran before attempting to force Tehran to give up its nuclear activities with military action. Kerry also left no doubt that the US would seriously consider a strike on Iran if the diplomatic talks broke down. The Reuters article further explained that when Obama stated all options are on the table with regard to Iran’s nuclear program, he was using diplomatic code for the possibility of military action. During the talks, urgency was placed on having Iran allow rigorous monitoring measures to remain in place to ensure any movement toward a nuclear weapon would be detected and the West could intervene. If Iran could be kept from moving close to a nuclear weapon, Western leaders could avoid facing the decision to respond militarily to its existence. As the nuclear negotiations progressed, it became more apparent to Putin and Russian foreign and defense policy officials that despite their insecurities about US intentions, the threat of military action was a fiction. Russia’s European counterparts in the P5+1 coalition began expressing doubts about the willingness of the US to use military force against Iran. The French were perhaps the first to publicly appraise Obama as unwilling to use military action to respond to Iran’s nuclear program. French Foreign Minister Laurent Fabius tried to outline what he thought were the reasons for Obama’s tack in a 2013 speech. He stated: “The United States seems no longer to wish to become absorbed by crises that do not align with its new vision of its national interest.” He suggested this explained “the non-response by strikes to the use of chemical weapons by the Damascus regime, whatever the red lines set a year earlier.” Fabius stated further that a redirection of US interests may be a manifestation of the “heavy trauma of the interventions in Iraq and Afghanistan” and what he perceived as the current “rather isolationist tendency” in American public opinion. Fabius lamented that without US engagement, the world would find “major crises left to themselves,” and “a strategic void could be created in the Middle East,” with widespread perception of “Western indecision” in a world less multipolar than “zero-polar.” According to a May 2, 2014 Reuters article German Chancellor Angela Merkel stated negotiations with Iran over its nuclear program must be given a chance, but she also said “If Iran does not meet its obligations, or does not meet them adequately, we remain ready to take back the current limited suspension of sanctions.” Merkel’s statement diverged considerably from those of Obama and Kerry who indicated a US readiness to act militarily if negotiations failed. The reluctance of Germany to support US military action sent a message to Russia that there was no unity in the West on it. Sanctions remain the greatest threat European leaders alone can pose to Iran if the talks failed. Only the US can effectively act with force against a nuclear capable Iran, but Obama would never want to go it alone against Iran. In sessions leading to April 2, 2015, urgency was placed on having Iran agree to keep rigorous monitoring measures to remain in place not just throughout the long duration of the agreement but even after the core limits of the agreement expire. That would ensure any movement toward nuclear weapons will be detected and providing the opportunity to intervene decisively to prevent Iran from acquiring a nuclear weapon. There was an apparent belief that if Iran was kept from moving secretly toward a nuclear bomb, Western leaders could avoid facing the decision to respond to its existence. As long as Obama was uncertain military action would achieve all objectives based on his concepts, Putin could imagine Obama refusing to go to war. Israeli F-16 jets flying in formation. US Undersecretary of State Wendy Sherman told Israel’s diplomatic reporters that a military operation against Iran would not stop its nuclear program. She explained “the best option is a diplomatic negotiated solution.” For Putin, Sherman’s words ended all guessing on US intentions with Iran. Even the tone in the US Congress softened. Congress drafted a bill that would require that the administration send the text of a final accord, along with classified material, to Congress as soon as it is completed. Speaker of the House of Representatives John Boehner stated “Congress absolutely should have the opportunity to review this deal.” He explained further, “We shouldn’t just count on the administration, which appears to want a deal at any cost.” The focus of most observers was the fact that the bill would halt the lifting of sanctions pending a thirty day Congressional review, and culminates in a possible vote to allow or forbid the lifting of sanctions imposed by Congress in exchange for the dismantling of much of Iran’s nuclear infrastructure. Actually, if Congress rejects the final agreement, Obama could still veto its legislation. It would take only 34 senators to sustain the veto, meaning Obama could lose upward of a dozen Democratic senators and still prevail. However, what was most important about the bill for Putin was that Congress accepted more sanctions as means to curb Iran’s nuclear ambitions, not war. Putin operates within a practically all-male, nationalist, power-oriented environment in the Kremlin. He sees Obama is confident in the better side of human nature, and likely views that as a weakness. Putin undoubtedly wants to find ways to exploit the benign, less aggressive side of Obama to the greatest degree possible before the end of his second term. Unlike the diverse group of cabinet-level officials and policy makers and analysts that advise Obama, Putin operates within a practically all-male, nationalist, power-oriented environment in the Kremlin. In thinking about Obama, Putin undoubtedly recognizes his US counterpart wants to be an honest broker. He sees Obama is confident in the better side of human nature, and operates under the notion that issues in foreign affairs can be resolved at the negotiating table. Given that, Putin and his advisers undoubtedly view Obama in a way akin to renowned United Kingdom Prime Minister Winston Churchill’s “boneless wonder.” Putin very likely hopes to exploit the benign, less aggressive side of Obama to the greatest degree possible before the end of his second term. Putin and Obama are very different men. After the Soviet Union’s collapse and internal chaos of the 1990s, Putin restored order in Russia by reestablishing the power of the state some might say with little regard for human and political rights. Putin’s style of management was shaped by his initial career as an officer in the Soviet Union’s Komitet Gosudarstvennoy Bezopasnosti (the Committee for State Security) known better as the KGB—the agency responsible for intelligence, counterintelligence, and internal security. He reached the rank of lieutenant colonel before retiring. Putin has been assisted by a small group of men who served alongside him during his KGB career. These men are referred to as siloviki (power men). At the pinnacle were those who came from a community of families in Putin’s hometown of St. Petersburg whose “roots” go back to first political police of the Communist Party known as the Cheka. Putin’s Cheka heritage includes a father and grandfather who served in the security service. He went to schools and a university Chekisty (Chekist) community progeny typically attended. Chekists share a view that the greatest danger to Russia comes from the West. They believe Western governments are driven to weaken Russia, create disorder, and make their country dependent on Western technologies. They feel that under former President Boris Yeltsin, the Russian leadership made the mistake of believing Russia no longer had any enemies. As Putin has noted in public statements, Chekists consider the collapse of the Soviet Union, under Western pressure, as the worst geopolitical catastrophe of the 20th Century. In a March 18, 2014 speech, Putin enumerated some actions taken by the West that have fostered his contempt. He mentioned: Russia’s economic collapse, which many Russians recall was worsened by destructive advice from Western business and economic experts that did more to cripple their country; the expansion of NATO to include members of the Soviet Union’s own alliance, the Warsaw Pact; the erroneous Russian decision to agree to the treaty limiting conventional forces in Europe, which he refers to as the “colonial treaty”; the West’s dismissal of Russia’s interests in Serbia and elsewhere; attempts to bring Georgia and Ukraine into NATO and the EU; and, Western efforts to instruct Russia on how to conduct its affairs domestically and internationally. Paradoxically, the aggressive behavior Putin attributes to the US has been displayed by him time and again. In 2008, Putin forced Armenia to break off its agreements with the EU, and Moldova was placed under similar pressure. That same year, Putin invaded Georgia. Russian troops still occupy the Abkhazia and South Ossetia regions. In November 2014, Putin signed a Russia-Abkhazia Treaty of Alliance and Integration which meant in practice Moscow is responsible for the customs, defense, and security of the separatist republic. In March 2015, Putin signed the Russian-South Ossetian Treaty of Alliance and Integration which has similar terms. Georgia has no chance of regaining its territories. In November 2013, using economic influence and political power, he drove then-Ukrainian President Viktor Yanukovych to abort a deal Ukraine had with the EU that would have pulled it toward the West. When the Ukrainian Parliament removed Yanukovych, Putin grabbed Crimea. Such moves legitimize NATO’s worries. Putin’s uncongenial attitude toward the West was very apparent while the Iran Talks were still underway. Incursions by Russian Tu-95 Bear H bombers (as the one shown above) in US and European airspace prompted the scrambling of fighter jets. Russia also sold its S-300 anti-aircraft missile system to Iran. This uncongenial attitude Putin has harbored toward the West was apparent during the Iran Talks. Perhaps he was testing his P5+1 partners. In August 2014, Russia signed a deal with Iran that undermined Western-led sanctions against the two countries. The memorandum of understanding between the two governments envisaged wider economic cooperation to include closer ties in the oil and gas sector, construction and rebuilding of generating capacity, development of a power supply network infrastructure, machinery, consumer goods, and agriculture. It laid the foundation for a multi-billion dollar deal between Moscow and Tehran, the so-called oil-for-goods contract. In addition to that contract, there was the sale of the S-300 anti-aircraft missile to Iran. The S-300 would neutralize any possibility that Israel could take unilateral action against Iran. That would remain the case until the Israeli Air Force receives F-35 fighters from the US. Only the US Air Force’s small fleet of B-2 stealth bombers would have a chance of hitting Iranian targets properly now. If the US and Europe repeatedly threaten and levy sanctions, Putin and his advisers may take audacious steps. Sensing his back is up against the wall, and unable to project strength otherwise, Putin might seek to deter further Western action by making extraordinary threats to use Russian military power. The Russian Ambassador to Denmark threatened that the Danes would become a target of Russian nuclear weapons if they participated in any missile defense program. Danish jets scrambled 58 times in 2014 to head off Russian aircraft. Russian strategic nuclear bombers also conducted numerous incursions into northwestern US air defense identification zones. Incursions by Russian Tu-95 Bear H bombers and intelligence-gathering jets in US and European airspace have prompted the scrambling of fighter jets. Russian military aircraft have been flying without transponders over Europe close to civilian aircraft. Putin warned Russia was developing new strategic nuclear weapons that would catch the West by surprise. Russia has moved Iskandar ballistic missiles to its Kaliningrad enclave between Lithuania and Poland and long-range, nuclear-capable bombers to Crimea. An April 18, 2015 Reuters article stated Putin recently softened his anti-US rhetoric only a week after accusing the US of trying to dominate world affairs and saying what it wanted was “not allies, but vassals.” Putin reportedly said on April 18th, “We have disagreements on several issues on the international agenda. But at the same time there is something that unites us, that forces us to work together.” He then stated, “I mean general efforts directed at making the world economy more democratic, measured, and bilateral, so that the world order is more democratic. We have a common agenda.” Similarly, the BBC reported that on March 6, 2014, after seizing Crimea, Putin told Obama by telephone that US-Russian “relations should not be sacrificed due to disagreements over individual, albeit extremely significant, international problems.” Regarding Crimea, Putin said Russia could not “ignore calls for help and acts accordingly, in full compliance with international law.” Given Obama’s record on the use of force, and what Russia observed during the Iran Talks, Putin may have calculated he has pushed hard enough, and he now can reap a negotiated resolution from Obama. Perhaps Putin assessed that as with Iran, talks might provide him with the chance to achieve many objectives. Fene libenter homines id quod volunt credunt. (Men readily believe what they want to believe.) The decay of Europe’s defense came as a result of a lack of commitment of the European countries, and to an extent the US, to the stewardship of NATO, militarily. After the Soviet Union’s collapse, NATO members became weary of investing financial resources in a deterrent force that did not face an apparent threat. There was no change in thinking despite Putin’s aggressive stance and actions against countries that are part of Russia’s “near abroad.” To surmount the impact of what the Western capitals were seeing, they ignored what they saw, made massive military cuts, and failed to meet their military commitments to NATO. Non mihi, non tibi, sed nobis! (Not for you, not for me, but for us!) Meetings between NATO allies can no longer simply amount to rhetorical conversations about collective security in Europe, pledges to do more, and proposals to rearrange the meager military resources currently available to face the vast, mobile, hard-hitting Armed Forces of the Russian Federation. Decisions must be made now on what will done in the face of a confrontation with Russia over future aggressive moves against Ukraine or any other sovereign state in Europe. Too many ambiguous political speeches and statements on US military power have already been made to create doubt over whether the US might respond at all. There must be clear discussions on a mutually acceptable political rationale for military action, despite its difficulties and horrors, must be established between the US and the Europe. US and European leaders must confirm now what they will commit and exactly how they will act together militarily. In a manner loud enough for Putin to hear, Obama, in particular, must continually confirm at the UN, in NATO, and in its members’ respective capitals that Europe can count on US support if a military confrontation becomes imminent. US Chairman of the Joint Chiefs of Staff, General Martin Dempsey, is cast in the same mold of a long line of senior military leaders who have effectively advised US presidents in time of crisis. According to a March 24, 2014, New York Times article entitled “Russia Is Ousted from Group of 8 by US and Allies,” US President Barack Obama and other leaders of the Group of 8 industrialized democracies cast Russia out of their organization to punish Russian President Vladimir Putin for his annexation of Crimea. The leaders also threatened tougher sanctions against Russian interests if Putin escalates aggression against Ukraine. When asked to discuss such efforts to compel a change in course by Russia, Putin and Russian Foreign Minister Sergei Lavrov have literally shrugged their shoulders. Other Russian officials have scoffed and mocked such measures with great bluster. Where possible, Putin has taken parallel actions against US and other Western interests in Russia. On the positive side, meetings between US Secretary of State John Kerry and Russian Foreign Minister Sergei Lavrov, who have regularly worked together on other urgent and important issues for both countries, have already begun. Every effective channel reportedly has been opened by the US to express a message to Russians of US concerns about Ukraine. However, there seems to be a notion held by Putin and Russian officials in their heightened state of alert that any efforts to find common ground with the US would amount to appeasement. Expressions of US positions have been interpreted as US demands, eliciting a reflex response by Moscow not only to reject those positions, but any proposals drawn from them. Communications are now somewhat mangled. All important telephone conversations between Obama and Putin have been reduced to bristling confrontations between the two. By all accounts, the conversations very likely would have been a finger-wagging sessions between Putin and Obama if they had taken place face to face. The situation remains tense and dangerous. Thinking outside of the box, handling the Russians, even with very apparent political and diplomatic aspects of the problem, might be facilitated with more input from a member of the US national security team who had recent success in negotiating with senior Russian military officials on critical defense matters. That individual is US Chairman of the Joint Chiefs of Staff, General Martin Dempsey. In addition to knowing what the most concerning Russian military capabilities and possibilities for action might be, his professional military experience, depth of knowledge, understanding of history, insights and worldliness, make him someone Obama perhaps could rely on more heavily for advice on the Ukrainian crisis. Indeed, as a senior military officer he may possesses the capability of being effective in advising Obama in such crises in a way perhaps not possible for other presidential advisers at the moment. Dempsey was recommended for the job of Chairman of the Joint Chiefs of Staff by then Secretary of Defense Robert Gates. Gates had already nominated Dempsey to be the Army Chief of Staff. In his recent book, Duty: Memoirs of a Secretary at War (Knopf, 2014), Gates explains that Dempsey had commanded forces in Iraq and command in Iraq or Afghanistan was a quality he wanted in the next chairman. Gates also thought Dempsey had also performed superbly as the deputy commander and acting commander of the US Central Command. When notifying Dempsey of his decision to nominate him as chairman, Gates explained to Dempsey that he was well-equipped to face the challenges of the budget, to lead the chiefs as a team, to maintain cohesion, and to help a new secretary of defense manage the relationship between the military services and the president. Obama has clearly been very satisfied with Dempsey, selecting him twice as chairman. Dempsey has dealt with a challenging agenda since assuming his present post. Most relevant in the Ukraine crisis has been Dempsey’s part of the process of ensuring sustained positive US-Russian relations. Dempsey recently demonstrated his ability to manage line of communication and promote constructive conversations with the Russians when he met with General Valery Gerasimov, Chief of the General Staff of the Armed Forces of the Russian Federation on January 21, 2014, in Brussels. In that long-scheduled meeting, Dempsey displayed solid judgment and diplomatic acumen to advance an agenda for bilateral military relations. The two generals produced a workable agreement that detailed 67 activities on which the armed forces of the US and Russia would continue to cooperate, despite pre-existing political and diplomatic problems and new concerns that arose over security assistance at the Sochi Olympic Games. Indeed, the meeting came amidst a blitz of criticism leveled against Putin and organizers of the Games by US officials. Those criticisms served to create the impression worldwide that the Games in Sochi were not safe to visit. The comments were almost perfectly designed to evoke the worst reaction possible from the Russians. By the end of the meeting, Gerasimov was comfortable enough to endorse “regular contacts” between their militaries as “quite useful.” Pointing to the less than congenial political and diplomatic relations between the US and Russia, Dempsey said it was important for the militaries “not to foreclose on conversations, even if at some points there are disagreements that prevent the forward movement” in other parts of the relationship whether political or diplomatic. There could be no better time to consider using of that effective line of communication than now. At the same meeting, to ensure a safe and secure Olympics, Dempsey made a nearly open-ended offer to Gerasimov to provide “full assistance” from the US military, echoing an offer made to Putin by phone that same week. Gerasimov’s reaction of expressing a need for anti-IED technology was plausible to the extent that Islamic militants could have used roadside bombs against Russian government or civilian vehicle at the Games. However, Russian Islamic militants were viewed as more likely to carry out a martyrdom operation (suicide attack) than plant a roadside bomb and detonate it at a distance. If Gerasimov hoped to exploit US concerns and generosity, that all stopped with Dempsey. He understood the implications of just giving it away, nonetheless, Dempsey remained quite respectful of the Russians’ request. He understood that it was after all the job of the Russian security services to seek advantages over potential adversaries, and the effort to exploit the thinking among US political officials should have been expected. There was a guarantee that Dempsey despite Gerasimov’s push for US technology would be guided foremost by his duty to defend the US. Abiding by that, Dempsey seemingly, instinctively stood his ground against Russian appeals “in the interest of improving military cooperation and communication” while truly seeking to further military ties likely more earnestly than his Russian counterpart. Dempsey’s insight on working with military elements of the Russian government could help his president through this crisis. Dempsey may very likely be able to demonstrate that there is a way to deal with Russians even under current conditions. He may be able to bring Russia to the diplomatic table, despite the very militaristic and aggressive mindset in which Russian leaders are currently steeped. In a pinch, he may very-well act as a brake on any possible runaway breakdown in US-Russian communications. However, to be most effective in providing perspective and military advice from the chiefs for Obama on Ukraine, Dempsey would need to heed lessons from his experience with Obama on Syria in August 2013. From that experience, Dempsey likely foresaw difficulties advisers would have in getting Obama to rapidly come to terms with any plans or proposals offered on Ukraine. Providing a range of military option to effectively achieve objectives based on the president’s concepts, would be not be sufficient enough with Obama. On Syria, Dempsey was initially tasked with providing advice and viable options for calibrated military strikes in response to Obama’s expressed goal of deterring and degrading Assad’s ability to use chemical weapons. In his Rose Garden statement, Obama took comfort in Dempsey’s advice, stating confidently: “The Chairman of the Joint Chiefs has informed me that we are prepared to strike whenever we choose. Moreover, the Chairman has indicated to me that our capacity to execute this mission is not time-sensitive; it will be effective tomorrow, or next week, or one month from now.” Yet, Obama was actually driven to resolve the crisis not by military action, but in a manner that would allow his worldview—that problems can be solved at the diplomatic table using reason and logic—to win through. Unable to quickly find that handle to the situation, uncertainty and indecisiveness ultimately prevailed. Obama was apparently paralyzed by fears of a bitter scenario that would have the US and the region embroiled in a larger conflict as a result of such action. That was coupled by his concerns over the legal ramifications and international implications of military action against Assad regime. Not knowing how best to respond, Obama strayed from a path of assertive and decisive action which most likely would have achieved all military goals and had a strong educational effect on Assad. After making very shrill accusations that the regime of Syrian President Bashar al-Assad had crossed his red-line by using chemical weapons, Obama made the now world renown decision not to take military action. Obama settled for a deal Russia proposed and negotiated with the US to eliminate Assad’s chemical weapons stockpile. Seeing how wrenching and difficult the decision making process on Syria was for his president, Dempsey surely understands that to ensure advice to Obama on Ukraine would be effective, the advice of the chiefs on military aspects of the situation would need to go in tandem with helping Obama remain strong and of good courage in the face of daunting circumstances. Fears of greater problems stimulate the imagination, can lead to a pessimistic outlook on the future, and often cause a leader to deviate from a path. Remaining confident a resolute when a crisis is brewing is made more difficult in a dispute such as the one between the US and Russia on Ukraine, when party seems determined to maintain an environment unfavorble for communication. Dempsey’s advice in that respect would need to be direct and personal. An example of how Dempsey might proceed would be to first put matters in perspective by discussing Ukraine from the context of the military stalemate that has existed between the US and Russia during and since the Cold War based in part on first-hand experience as a US Army officer. Following that, Dempsey could assist Obama in understanding the calculated risks and possible outcomes of a variety of diplomatic and military initiatives with Russia given assessments made both in the past and present to make the situation more controllable for his president. Consideration of what is possible to do and what will likely be faced would also facilitate reaching decisions on options to help bring Putin and Russian officials to a point where negotiation on the issues might be possible. That is the advice Obama apparently wants foremost. Along the way, Dempsey could continually assure Obama that he has the full support of the military chiefs. He could assist Obama in mulling over possible courses of action to ensure a sharpening of his perception and clarity of direction. Boiled down, Dempsey’s role would be that of mentor or coach for Obama, who apparently is still trying to understand how to manage US military capabilities, leveraging US strength through diplomacy and engaging in decision making on the use of force to deter and defeat opponents. Putin and Russian officials may discern “tweaks” in Obama administration’s message and communications prompted by Dempsey, and respond favorably to a request to negotiate. The US and its European partners have met to discuss and level sanctions and other economic actions against Russian interests in retribution to the Crimea-grab and to deter Russian efforts to further destabilize a weak Ukraine. However, Putin has executed plans to annex Crimea and a return to the status quo ante will not occur. For Obama’s advisers, finding ways to bring Russia to the diplomatic table, given the confrontational attitude of Putin and Russian leaders, has been challenging. However, resolving the Ukraine crisis may more importantly require bringing Obama to see and understand that it requires a certain agility to develop solutions for coping with opponents whose thinking is different from his own. “Might doesn’t make right,” an utterance recently heard from Obama, is not best philosophy to which one might subscribe when dealing with real aggression. This is particularly true for the US which predicates its ability to engage effectively in diplomacy worldwide on its capability to enforce its policies and protect its interests with considerable military power. Advisers such as Susan Rice, Antony Blinken, Wendy Sherman, and Samantha Power, in addition to well-experience officials as Joe Biden, John Kerry, Chuck Hagel, and John Brennan, certainly have a great deal to offer to Obama. Yet, results show that they, most likely for various important reasons, have been unable able to reach Obama over the Ukraine crisis in a manner that has allowed him to appear truly in control of the situation. There is a certain “human element” to advising leaders in time of crisis. In recent history, a line of remarkable senior military officers have very effectively served their presidents in a manner described here. Included among them are: Maxwell Taylor, Brent Scowcroft, Stansfield Turner, Alexander Haig, Colin Powell, and James Jones. Dempsey was recommended as chairman based on his military experience. That same military experience made him “expert” in encouraging, advising, and coaching fellow commanders in difficult circumstances. Dempsey’s counsel would truly help his president in dealing with Putin and the Russians beyond the battlefield or even the diplomatic table. Hopefully, Obama will somehow come to understand the benefits that would come from more fully utilizing Dempsey, and seek “greater” counsel from him soon. In a December 1, 2013 article in the New York Times entitled, “Politics and a Ruptured Tendon Don’t Faze Lead Iran Negotiator,” it was reported that US Under Secretary of State, and lead US negotiator with Iran, Wendy Sherman, fell and ruptured a tendon in her finger. She was on her way to brief highly skeptical Members of Congress about the deal she was negotiating in secretive talks with the Iranians. The article explained that Sherman simply packed her finger in ice right after her fall, went into a secure room, and continued her briefing to Congress on uranium enrichment levels and current intelligence on Iran. Only afterward did she go to an emergency room. The White House used the incident as an opportunity to influence perceptions of Sherman in the Congress and in Iran. She was called “focused” and “tenacious.” Deputy National Security Advisor Antony Blinken, who has coordinated Iran strategy, was quoted as saying, “She’s not the kind to pay attention to pain.” While Members of Congress may have been impressed by reports of the very dutiful public servant’s dsiplay of physical toughness, the White House had little chance of using poaitive spin to influence perceptions of Sherman in Iran. In his public statements, Zarif has directly challenged the view that Iran caved in to US demands. Moreover, he has made statements that unquestionably play into the sense that Iran “got one over” on the US and the West. He appears extremely confident that he will reach all of Iran’s goals through the negotiation. Nothing Zarif has said varies much from statements made by the Supreme Leader, Ayatollah Ali Khamenei, Iranian President Hassan Rouhani, Iranian Revolutionary Guards Corps commanders, and hardline political and religious leaders. However, Zarif must be careful not to lean so far to satisfy superiors and hardliners with his public statements that he erodes existing trust Western negotiators have in him. More importantly, he must be careful not to forge ahead, by taking steps shaped by dogma and public boasts. That could lead to unintended consequences for Iran in the near future. Once the November 23, 2013 agreement was reached in Geneva, Zarif’s comments seemed more assertive. On Twitter, Zarif insisted that Iran retained its right to enrich despite comments to the contrary from US officials and political pundits. He tweeted, “The right to enrichment emanates from the inalienable right in NPT, defined by 2010 NPT Review Conference to include fuel cycle activities.” He stated that according to the 2010 NPT Review, “each country’s policies and choices with regard to peaceful nuclear energy including its fuel cycle policies should be respected.” He further stated that the “US and all other E3+3 joined the 2010 consensus at the NPT Review Conference. The right was first recognized by consensus in 1978 SSODI [Special Session on Disarmament].” His statement was compelling, nevertheless, that issue was no longer being debated. Iran agreed in the new accord to freeze the expansion of its nuclear activities, and refrain from uranium enrichment above low-level purity, including 20 percent. Zarif appeared to be pointing out that the interim accord was at all not in line with the terms of international agreements Iran to which was already committed on nuclear technology and that Iran did not necessarily need to adhere to the new interim accord. After the interim accord was reached, the official IRNA news agency quoted Zarif as saying in Tehran, “Iran will decide the level of enrichment according to its needs for different purposes.” He made it clear that “Only details of the enrichment activities are negotiable” referring to the final accord. According to the Fars news agency, Zarif stated “We have always said we will not allow anyone to determine our needs.” He went on to state “But we are prepared to negotiate about it.” However, the US, Britain, France, and Germany hope the final agreement will scale back Iran’s uranium enrichment activities, which could be redirected at producing highly enrich uranium for creating a nuclear device. Zarif’s statements again indicated that although he helped cobble and sign the interim accord, however the decision on how Iran would proceed on the issues covered by the accord was open to the judgement of Islamic Republic’s leadership. Choppy waters may lie ahead for the Geneva talks given Zarif’s intriguing representations of facts and their ambiguous statements about Iran’s rights after signing the interim accord. In a letter regarding the Geneva talks from Rouhani to Khamenei published in the Iranian news media, Rouhani stated “The first step advanced an acknowledgement of Iran’s nuclear rights and right to enrich by world powers—who tried to deny them for years—and opened a path for the next steps to protect the technological and economic advances of the country.” Before and after his election, Rouhani insisted that Iran be treated as an equal in its relations with the US. To support the dialogue between nations, the Obama administration approached bilateral talks with Iran based on this notion of equality. In reality, however, thie two states are not equal. In spite of steep cuts ib the size of the US armed forces by the Obama administration and economic woes, the US remains a nuclear armed superpower. As a nation, the US is strong and certainly not a push over. Despite the claims of some political pundits, and Russian President Vladimir Putin, a nuclear weapons program or a few devices will not deter a US attack. Zarif’s superiors in Tehran want economic sanctions lifted and the ability to use their nuclear program as they choose. However, Zarif, a true diplomat, is astute enough to know that Geneva will not be a “slam dunk.” He must know that significant sanctions relief would be difficult, if not impossible to realize, without a significant and permanent change regarding Iran’s nuclear program. Further, despite what might be thought in Tehran, the true focus of the Geneva process is not sanctions, but Iran’s potential development and use of nuclear weapons. Talks about nuclear weapons concern nuclear war, and for that reason, the talks to some degree regard the very survival of Iran as a nation. For nearly six decades, the US has been engaged in nuclear talks, initially with the Soviet Union, and with Russia and North Korea since. Those talks have concerned issues such as the size of nuclear forces, production of weapons, and testing. Known better as as arms control talks when concerning the Russians, they have been important enough that summit meetings often become part of the process. Public discussion of furtive aspects of such negotiations is typically negligible. That should also be the case for the Geneva talks. Perhaps the Obama administration has made significant concessions to reach an historic” agreement. It could very well be that Zarif and the Iranian leadership have scored one on the White House. Yet, the president, his cabinet, and his staff are caretakers of the US government. A new administration will govern in the US in three years. It would be a tragedy for the new administration to discover, after coming to office, that the Geneva negotiations were, as Khamenei indicated, “an artificial maneuver and utilized various methods to achieve various goals and ideals of the Islamic system.” The incoming president’s response to a bad agreement reached now, or breached one, may be severe. Given the list of prospective candidates for the 2016 US presidential election, it is almost certain that the requisite political will to take action will exist. It would be in everyone’s interest for Zarif not to exploit problems he may perceive in the Obama administration, but rather, negotiate unequivocal terms Iran truly intends to keep. Iranian Foreign Minister Mohammad Javad Zarif (at right) confers with the Head of the Iranian Atomic Energy Organization (IAEO) Ali Akbar Salehi (at left), at the November 25, 2013 IAEO Basij Conference. Salehi was President Mahmoud Ahmadinejad’s foreign minister. Before taking that post, Salehi served as head of the IAEO for a year. Prior to that, Salehi was Iran’s envoy to the International Atomic Energy Agency. Both officials know what is at stake in Geneva. Surely, Zarif hopes they will still be able to smile at the end of the negotiations.